Continuing symptoms: Sore feet, frequent bathroom visits, sore hips, braxton hicks, swollen feet and hands. New symptoms this week: Menstrual-like cramping, I have read and heard from a few women that this could be contractions. And it does come in waves, so perhaps this is the real braxton hicks. 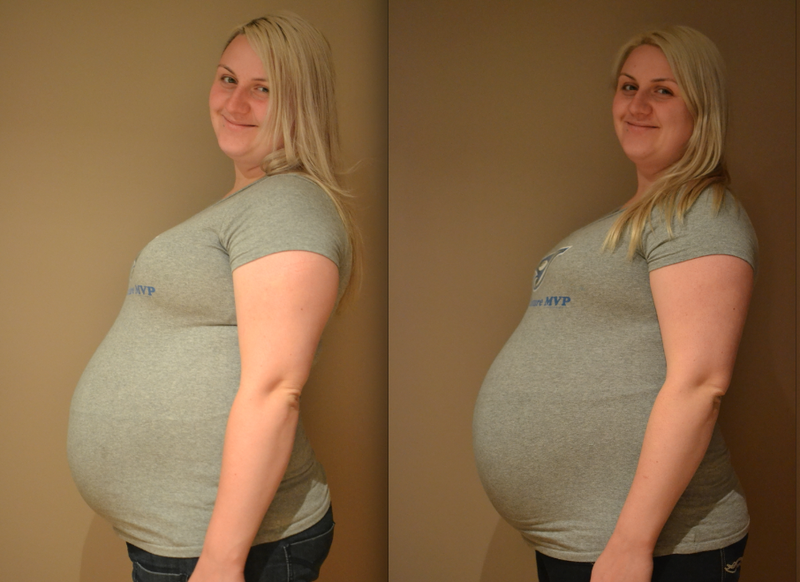 Maternity Clothes: I am amazed that everything still fits well!! Other Pregnancy News: Only 4 weeks left until my due date. It seems so crazy close. It is so hard to believe that pretty much any day we could be meeting our baby. I feel so ready and so unprepared all at the same time. This is my 28 week and 36 week pictures. I can't say that there is a tonne of difference, not as much as I feel anyways! My sister in law took some maternity pics of me yesterday, I will try to post them this week!